Reading International, Inc. (NASDAQ:RDI) (NASDAQ:RDIB) recent encounter with a few weak movie offerings and short-lived foreign currency headwinds provides an inexpensive entry point for investment into this under-followed movie theater operator/owner and real estate developer. Temporary factors modestly weakened the June Q2 2012 operating results of Reading, a small-cap company with $250MM of LTM revenue, and contributed to price weakness from mid-June to mid-August in RDI shares. An August 13, 2012, Barron’s article, entitled “Popcorn and Property” [found here if free access is still operable] reversed this price weakness but only to the levels where the stock traded in mid-June before Reading International, Inc. (NASDAQ:RDI) (NASDAQ:RDIB) shares were added into the Russell 2000 Index. Despite the company’s fairly consistent delivery of operating performance and its large cinema market shares in Australia (#4), New Zealand (#3) and the United States (#11), Reading International lacks research coverage from any sell-side entertainment, consumer non-durable, or real estate industry analyst. Now, with RDI trading in and out of index funds daily, and having captured its first real media attention, a more liquid window to trade into these under-valued shares has been created. In a virtuous cycle, the improved trading liquidity may also attract incremental investment following and a higher valuation. Reading International, Inc. (NASDAQ:RDI) trades at a substantial discount to the company’s intrinsic value and at a discount to book value/share, unlike any of the three larger US publicly-traded theater exhibitors, Regal Entertainment Group (NYSE:RGC), Cinemark Holdings, Inc. (NYSE:CNK) and Carmike Cinemas, Inc. (NASDAQ:CKEC). As Reading continues to grow its sustainable cash flows and builds and unlocks appreciated value in its geographically diversified real estate holdings, investors will eventually narrow the “value gap” that presently exists in RDI shares. The first place to begin analyzing and seeing the enormous hard asset value embedded in Reading International’s balance sheet is the company’s elaborate 2012 Annual Meeting slide presentation, filed as a May 23, 2012, 8-K exhibit here. The presentation illustrates, with charts, tables, and a ton of pictures, that Reading is loaded with hard assets, not just in the United States (see also p.42 for additional detail of major US assets) but also in Australia (see also p.29 for additional detail of major Aus assets) and New Zealand (see also p.17 for additional detail of major NZ assets.) In addition, this past Just One Stock interview and my other Seeking Alpha articles on Reading will provide readers historical background on the company and a road map on the progress of its many cinema and real estate projects. According to Box Office Mojo, Domestic Q2 2012 total movie grosses were down 1.2% from prior year, despite “The Avengers” breaking several summer and opening box office records here and abroad. Q3-to-date has also been weak, first, from theater security concerns after the Aurora, Colorado cinema shootings, followed by weaker offerings put out by studios during the Summer Olympics. Reading’s most recent June Q2 2012 10-Q can be found here and certain salient findings of this quarter’s filing are discussed, below. While six-months ended June 2012 operating results remain up y/y, Reading’s Q2 revenues, operating income and adjusted operating EBITDA (Op Income + Dptn/Amort) were all down y/y vs. a strong 2011. Modest declines in both attendance and average ticket prices at many of Reading’s cinema chains and a stronger US dollar in Reading’s Australian and New Zealand markets were the primary factors impacting Q2 operating results and shifts in net book value. Cinema segment margin declines vs. prior year were impacted from negative operating leverage from lower attendance yields in theaters and accompanying decreased high margin concessions. These figures were modestly offset by improvements in New Zealand cinema revenues helped by the reopening of a major New Zealand multiplex closed from earthquake damage. Continued growth in Q2 of the Real Estate segment partially offset the Cinema segment weakness. Y/y increases resulted from improved live theater revenue in the US and higher rents and occupancy in Australia and New Zealand, offset by currency weakness in those same foreign markets. Q2’s Net Income of $0.2MM was substantially lower than prior year as 2011’s Q2 pre-tax income included a large one-time $13.8MM tax benefit from reducing some of Reading’s huge tax NOL valuation reserves and a non-recurring $1.7MM gain from the sale of an Australian cinema. Reading finished the June quarter with lower debt and substantial liquidity. As of June 30, 2012, Reading had cash and marketable securities of $33.1MM. Debt, net of this cash, was $170.5MM, $15.2MM lower than prior year. Reading also has a combined $24.8MM of undrawn availability on its several lines of credit. Extended debt maturities and lower rates on debt – During Q2, the interest rate on Reading’s $27.9MM of Trust Preferred Securities (classified as Subordinated Debt due 2027) dropped a sizable 4.75%, from a fixed rate of 9.22%, which was in effect for the past five years, to a variable rate of three-month LIBOR plus 4.00%. The new rate is 4.47% and resets each quarter. 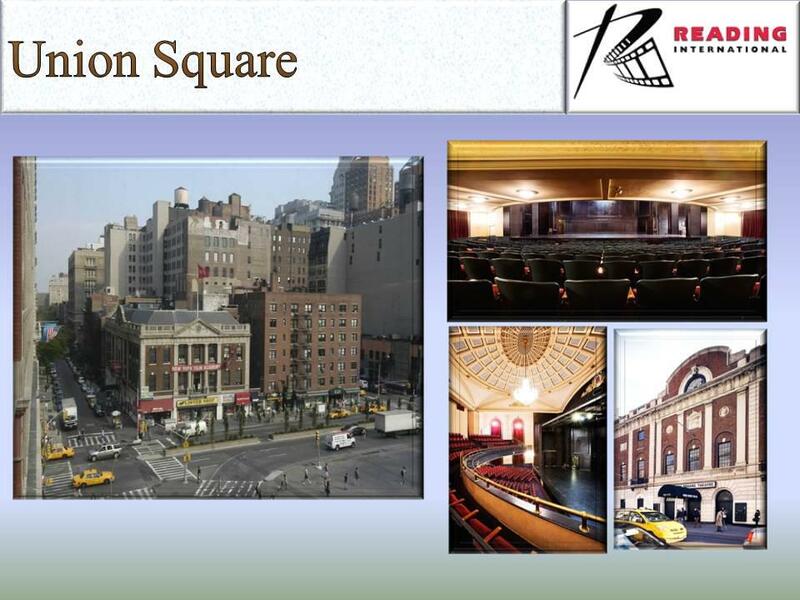 At the end of the quarter, Reading’s Sutton Hill Properties, LLC, subsidiary, which owns the Cinemas 1,2 & 3 land and building on Third Avenue in New York City, successfully refinanced its $15MM loan at an interest rate 1.48% lower than the matured loan. Consistent with Reading’s goal of monetizing this asset, the loan has no prepayment penalty after 6 months and only a small cost if prepaid before then. Additional real estate sales progress – In Q1, Reading sold its 1.1 acres of undeveloped land in the Taringa suburb of Brisbane, Australia. After the close of this recent Q2, Reading has now entered into an agreement to sell its Lake Taupo, NZ property for a gain. New 8-plex opening at Mosiac – A new 8-plex, the Angelika Film Center at Mosiac, in the Virginia suburbs of Washington, DC, opens next month at the end of September. With a Book Value of $5.43/share, Reading’s current Price/Book value of 1X remains cheaper than all of its public cinema peers. In addition, the table, updated below for Q2 results and Carmike’s secondary stock issuance, illustrates that Reading’s Net Debt to Total Assets % remains amongst the industry’s most conservative. In fact, as of June 30, 2012, Regal has a negative book value from sizable past losses, restructurings and distributions in excess of income. * Closing prices as of 08/16/12, all balance sheet items from 6/30/12 10-Q. What makes the table, above, so compelling is that Reading’s true asset and book values are higher than presented in Reading’s financial statements as they greatly understate the current fair market value of Reading’s Australian, New Zealand, New York and Chicago real estate. Much of this real estate has appreciated in value (over the course of more than 10 years of inflation on some parcels) from population growth, up-zoning to expanded/more valuable allowed uses, and in some instances, completed development into rent-generating parcels. In addition to stated book value and the substantial amount of unrealized gain embedded in Reading’s long-held real estate, the footnotes of Reading’s 2011 10-K disclose that Reading had $95.1MM in tax NOL’s at December 31, 2011 ($45.9MM and $15.8 MM of Australian and New Zealand tax NOL’s, without any expiration date, respectively, and $33.4MM of US NOL’s not expiring until at least 2025.. These tax carry-forwards should shield future unlocking of embedded real estate gains as well as pre-tax income growth from taxation for several years. There is also substantial embedded value in Reading’s many long-held real estate properties in Australia and New Zealand. For example, this Seeking Alpha article, reporting on Reading’s May 2011 Annual Meeting, discussed Reading’s large 51-acre Burwood Square development parcel in Melbourne Australia and its plans to subdivide and monetize all or at least the residential portions of this property. The color-coded property map of Burwood Square in the linked photo shows the three planned sub-divisions: residential (green), residential/commercial (blue), and retail/entertainment (yellow). 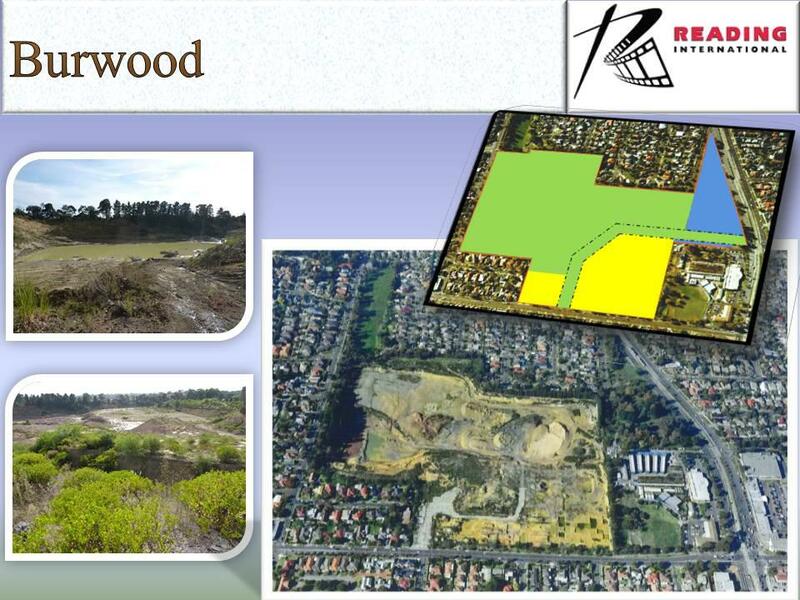 During this year’s May 2012 Annual Meeting Q&A session, Reading’s CEO stated that he viewed the Burwood Square parcel to be worth “at least” $75MM, which, alone, is worth >$3.25/share. This estimate seems to be conservative based on CBRE appraised values for just portions of the overall parcel, disclosed in this post-meeting May 24, 2011, Reading press release. This Burwood Square development parcel remains completely unencumbered by any debt. Thus, all sales proceeds could provide incremental debt reduction and/or capital for Reading’s current plans to lead development of this parcel’s 11-acre retail/entertainment (yellow) zone. Still trading at a substantial discount to a book value greatly understating the value of its sizable real estate holdings, Reading International’s favorable internationally diversified movie exhibition growth profile and conservative balance sheet make for a compelling risk/reward investment and now with a more liquid trading window. Disclosure: Funds I manage are long RDI, RDIB. These funds or its affiliates may buy or sell securities of these issuers at any time. Author: AndrewShapiroAndrew Shapiro is Founder, President and Portfolio Manager of Lawndale Capital Management, an investment advisor that has managed activist hedge funds focused on small- and micro-cap companies for over 18 years. Mr. Shapiro’s proactive ownership approach has been effective in directly creating and unlocking shareholder value in Lawndale’s portfolio companies and has contributed to Lawndale’s activist funds often being ranked among the top event-driven and small-cap value funds in peer databases for long-term performance. In addition to leading Lawndale, Mr. Shapiro has also served as a Director or Observer on portfolio company boards and debt and equity bankruptcy committees. Mr. Shapiro is a member of the National Association of Corporate Directors (NACD) and Lawndale has been a long-time Sustaining Member of the Council of Institutional Investors (CII). Mr. Shapiro has more than two decades of portfolio management and analytically varied experience from a number of "buy-side" positions, employing a rare combination of credit, legal and equity analytic and workout skills. Prior to founding the Lawndale organization in 1992, Mr. Shapiro managed the workout and restructuring of large portfolios of high-yield bonds, distressed equities and risk arbitrage securities for the Belzberg family's entity, First City Capital. Before joining First City, Mr. Shapiro was involved in numerous highly leveraged corporate acquisition and recapitalization transactions for both Manufacturers Hanover Trust and the Spectrum Group, a private equity firm. Mr. Shapiro received his JD degree from the UCLA School of Law where he was an Olin Fellow, an MBA from UCLA's Anderson Graduate School of Management where he was a Venture Capital Fellow and a BS in Business Administration from UC Berkeley's Haas School of Business, where he has taught finance courses and frequently guest lectures. Mr. Shapiro is often quoted on matters of corporate governance, fiduciary duty and activist investing and has been the subject of several articles, including a Business Week article in 2000 calling him “The Gary Cooper of Governance”. He is also a frequent speaker on corporate governance and activist investing issues at a broad range of prestigious forums that include the Council of Institutional Investors, National Association of Corporate Directors, American Society of Corporate Secretaries, SEC Advisory Committee on Small Public Companies, and the Director’s education programs of Stanford Law School, UCLA Anderson Grad. School of Mgmt., the Wisconsin Business School and Yale’s Millstein Center for Corporate Governance, among others. Mr. Shapiro started Lawndale’s funds in 1993 with only $188,000 under management and through performance and added capital has grown the firm’s managed assets substantially. In many of its investments, the firm plays a constructive relational role by actively working with Boards and management teams to help them achieve their strategic and operating goals. In other investments, Lawndale is a direct value-unlocking catalyst, utilizing a range of tools that include aggressively promoting improvements in a company's governance and operational structures, asserting shareowner’s legal rights and taking active roles in restructuring and buyout proposal negotiations.